Hello. This morning I noticed an entry in security history that mentions that Norton Autofix was activated while my father was logged on. I asked him about it and he said it looked like an update or something was available through Norton. He activated it and it must've been connected to Autofix somehow. I know this sounds weird. I didn't see any of it myself, so I don't know exactly what happened. I checked the results and ran it myself and there appeared to be no issues with the program. Does anyone know what this is or if there's a problem? Thanks! got same message today - my feeling is that it's spam or more likely a phishing situation - I closed it out , i.e. ignored it - don't think it's legit . Is it serious, then? What can I do? Is it serious, then? Is there anything I can do? Are either or both of you in fact using Comcast Norton Security Suite? Please come back with your operating system and name/versin of your Norton product (Support > About). Our OS is Windows 7 and our norton version is v20. The most recent version. As I mentionned in your other thread, if there are some missing or corrupted Windows files, then NIS cannot run properly sometimes, that's probably the reason of Norton Autofix being activated by itself in order to try to fix the problem, which probably couldn't be corrected. What about the message ubermax and I encountered? How serious is that? As long as there is a green checkmark on the Norton icon in your system tray indicating that Norton is healthy, there is nothing to be concerned about. If you want to run Autofix manually to reassure yourself that all is well, you can do so by clicking Support > Get Support. Norton History logs show past events - if Norton is not alerting to any problems currently, the log entries simply indicate things that Norton has already taken care of, and which require no further action. Ok, it's just ubermax up there made out like it was a phishing situation. I really don't know much about that sort of thing so I'm concerned we may've been scammed or something. Phishing requires some action on the user's part, such as clicking a link and entering information on a website. Without more clarity about what actually happened, it is hard to know if what your father saw was even connected with anything shown in the Norton logs. It probably was just some kind of update. The example shown above is NIS 2012 product behaviour captured during the NIS 2012 product beta testing cycle. Product behaviour like this typically doesn't change between the beta and released versions of the product. Open NIS > Advanced > History. Select 'Norton Error Reporting' in the 'Show' dropdown box. Locate the Norton Autofix entry that you mentioned above. 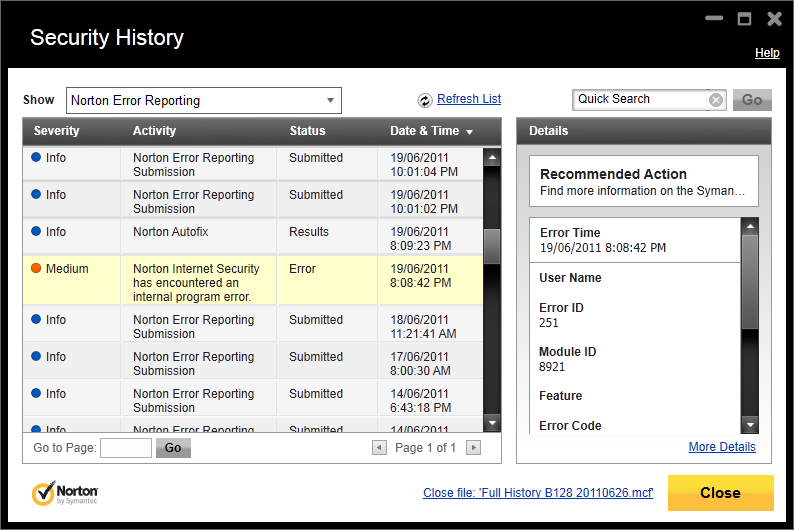 Look for a 'Medium' severity entry like the one above that occurred immediately prior to the Norton Autofix entry. Please review your Security History as per the instructions above and let us know the outcome. That information is no longer available. I had uninstalled and reinstalled NIS shortly after that incident had occured and it took all the history prior to that moment with it. But I check the security history pretty regularly. If something weird like that were to have come up, I would've noticed it. Sorry about that. Does this help at all? You have recently posted a thread in "Tech Outpost" section, where you have clearly described a BSOD. BSOD, doesn't occur because the OS is not at good mood or because the weather is rainy. There is clearly a problem with some Windows files and troubleshooting can be a tedious task. I asked you to try to reinstall the OS as this could fix most of the problems. You can reinstall NIS about 20 times a day, this WILL NOT HELP. That's probably the reason why you have problems also with NIS, (Autofix running by itself etc), but in my opinion you do not want to listen. So, be my guest and ask to the community a new question every 2 days.